Montage Kapalua Bay presents the exclusive 5-Course Winemaker Dinner featuring renowned Celebrity Chef Michael Mina on Saturday, June 13th! 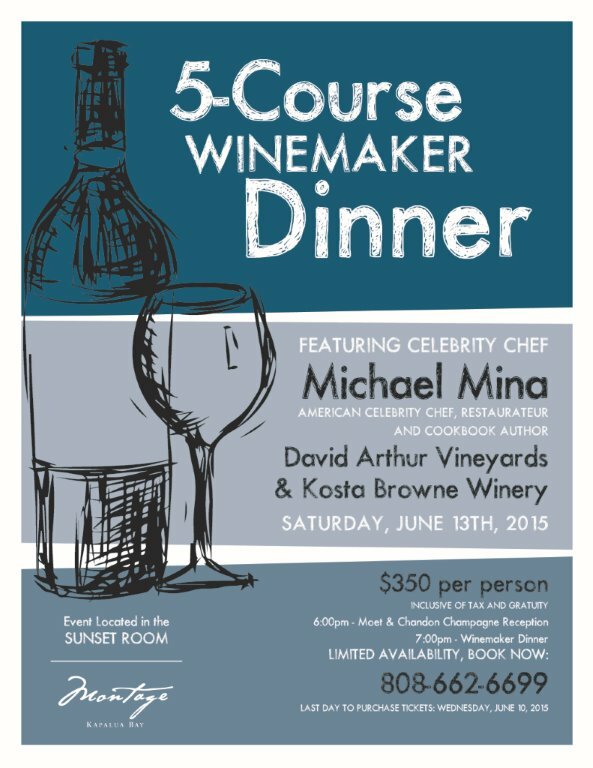 Chef Mina and the award-winning wineries of David Arthur Vineyards and Kosta Browne Winery present this spectacular culinary experience at the Sunset Room at Montage Kapalua Bay. Moët & Chandon Champagne Reception begins at 6pm; dinner to follow. $350 per person – Inclusive of tax and gratuity. Space is limited. For more information and reservation, call Montage Kapalua Bay at 808-662-6699. Kapalua Wine & Food Festival’s hallmark event, the Grand Tasting, returns Friday June 12th from 6 to 9 pm on the oceanfront lawns of Montage Kapalua Bay. Join the Kapalua Family of restaurants as they present their culinary specialties; all paired with premium and exclusives wines from around the globe. Rising star local entertainer Lily Meola provides entertainment. On Sunday, June 21st at 5 p.m, the weekly Uncorked: Wine Series will be taken over by a whiskey tasting. Treat dad to an educated and entertaining experience about the indulgence of whiskey. Resort sommelier Vanessa Lampson will host the tasting and give attendees a look into the world of whiskey. Guests will also enjoy light bites from Cane & Canoe’s menu developed by Sous Chef Davis Hood, which are created specifically to pair with each whiskey.“Uncorked” is $35 per person and includes three tasting portions of whiskey and light appetizers. Limited Space. Advanced reservations required; please call 808-662-6681.